Our first round-robin championship match saw us travel to neighbours Silverbridge. Heavy showers throughout the day left conditions very slippy. The scoring got underway in the second half with two points a piece from both sides, Aaron and Tony Kernan the scorers for us, in the opening ten minutes. A trio of points from Silverbridge left just one before the sides with fifteen left on the clock. Another point for us increased the lead to two. As the game entered the final minutes, we were in for an exciting finish. 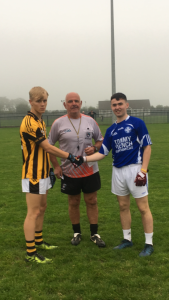 Two points for each team, Cían Mcconville and Micéal McCabe our scorers, the Bridge Scores the result of two converted frees to leave two still the difference with normal time nearly up. Silverbridge converted a free on the thirtieth minute to leave the bare minimum between the sides once again. As the game entered injury time, the Bridge had a chance to level the match, a ’45 which fell short just before the referee blew the full time whistle. 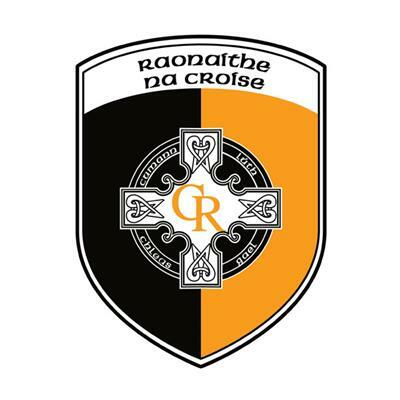 The Seniors now travel to Madden next Saturday evening for their round 2 clash in the Armagh Senior Championship. 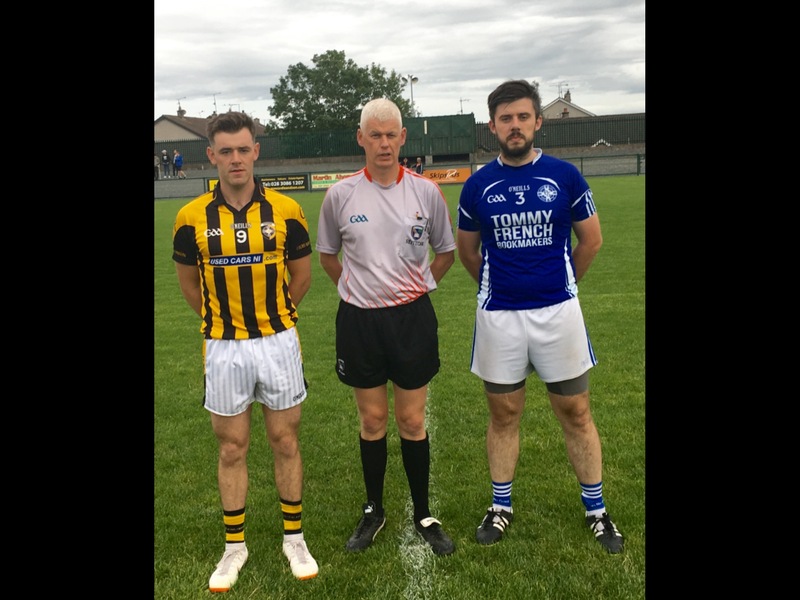 McWall Design LTD, Forkhill sponsored the ball for our opening Senior Championship fixture with with Silverbridge on Friday night. Thanks very much to Fintan & the McWall family for your sponsorship and ongoing support for the club. Clan na Gael settled quickly and the opening quarter of the match was a very one sided affair with the Lurgan men firmly in control. They had registered 0-4 before we got our opening score, a John Murtagh point the result of a free converted. Clans strengthened their lead with two more points before Shane McConville was dragged down and we were awarded a penalty. Shortly after the ball threw the ball in, A ’45 for Cross which John Murtagh pointed over the bar got the scoring in the second half underway. Seconds later the ball was the opposite end of the field in the Cross net and the goal put Clan na Gael in a commanding position. 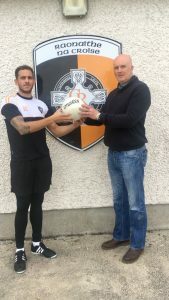 Cross responded, points from Shane McConville and Ryan Conlon before a superb goal from Ruairi O’Neill put us right back in the game and only one seperated the sides. Clans scored a point and just past the midway point of the second half a Ryan Conlon point brought it back to a one point game. A point each from both sides and with less than seven to go the bare minimum still separated both teams. Hard luck lads and management. 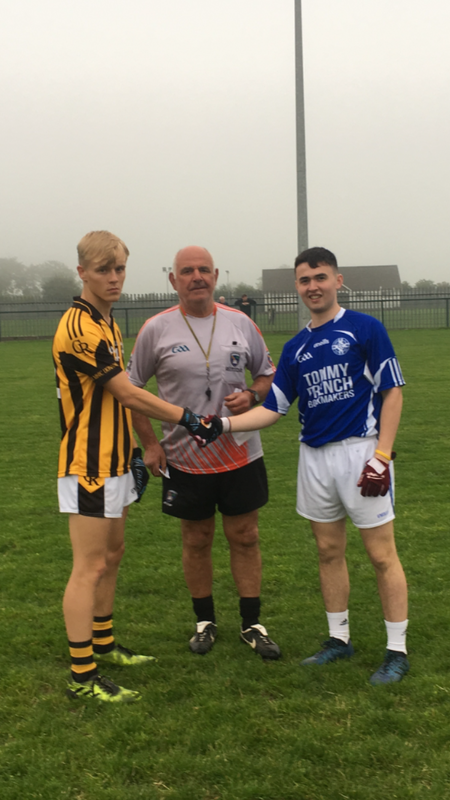 A late start for our minor championship match saw the game played under lights with Owen Reel refereeing. A dark dismal evening with fog left conditions and visibility difficult. We were quick off the mark, registering four points on the board before the Lurgan boys got their opening score, a point in the seventh minute. We scored three points, Clans scored two to leave us ahead by four at the midway point of the first half. The second half was very much one way traffic for us, a Cían McConville point seconds after the ball was threw in set the precedent for how the half was to be payed out. We clocked up 5-08 in the second half, a half were we were very much in control and where our lead was never compromised. 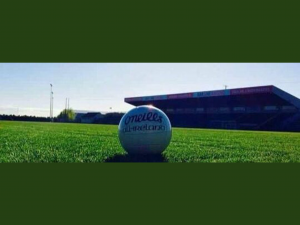 Well done to the U14, U12 & U10 squads who took part in challenge matches during the week against Clonduff and Doanghmoyne. The games were highly competitive sporting encounters. 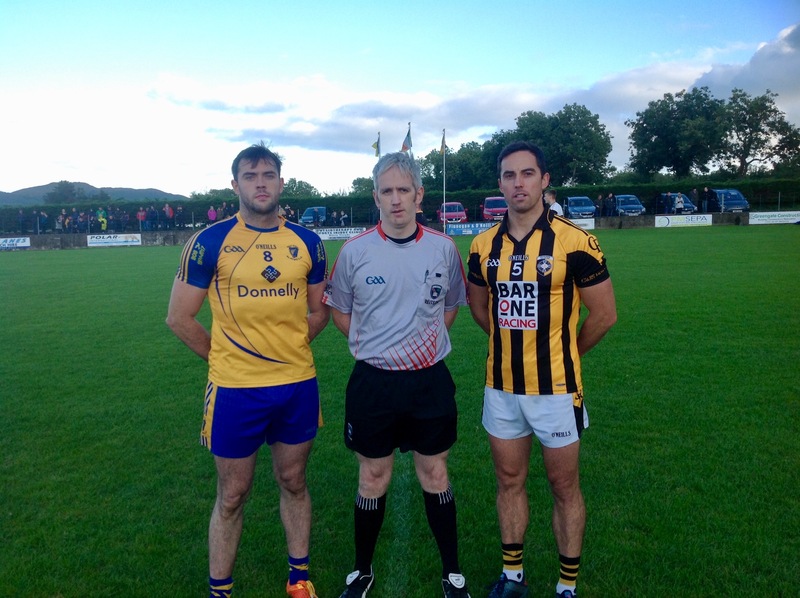 Thanks to Clonduff who made the journey on Tuesday evening and Donaghmoyne on Wednesday evening. On Saturday U10’s & U12’s played in Blitz’s. Well done boys and managements. Hard luck to our seniors, who played their championship semi-final against Carrickcruppen on Thursday evening past. The girls were up against a strong and experienced side, and as this was their first year in senior, it was great to see them reach the semi-final. Meanwhile our U16 squad have had an eventful championship campaign, after travelling to St. Paul’s in Lurgan on Monday night. The girls had a strong lead of 6.04 to 0.01, when an unfortunate accident meant that game had to be abandoned, with one of the St. Paul’s players breaking her leg. We wish her all the best and a speedy recovery. The girls now progress to the semi-final, where they will meet Mullaghbawn on the 6th September at 7pm. Good luck to all the squad, with the preparations. After a short meeting with the parents last week, it was agreed that training will continue over the autumn and winter on a Monday night. This will begin on Mon 17th September, and all training will be in the youth club. All parents have agreed to support, and rota to help out will be posted on the group chat. Thank you to everyone for their support. Tickets for our juvenile Draw need to be returned immediately. 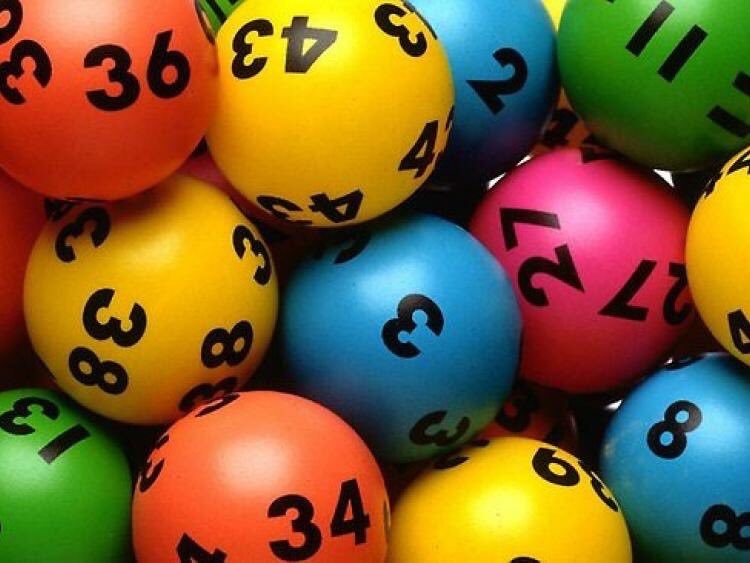 We hope to hold the draw during the interval at bingo on Monday night. There are some fantastic prizes on offer and all proceeds from the draw will go directly to the underage teams in the club. Thank you to everyone who bought tickets for the draw. 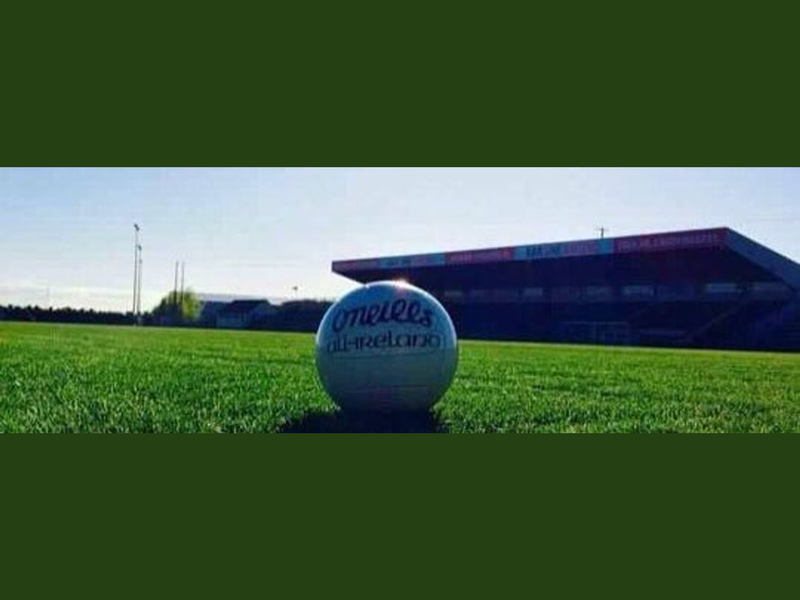 Any members who wish to put their name in the hat for the opportunity to purchase two All Ireland Final tickets should email the club secretary at [email protected] before 8.00pm on Tuesday. 4 matched 3 numbers; Tommy McGuinness, Joe Martin RVP, Joseph Ogle & Charlie Hughes each win £25. Congratulations to our match three winners. We are all super excited about our upcoming tea party which will take place on Sunday 9th September at 6.00pm. 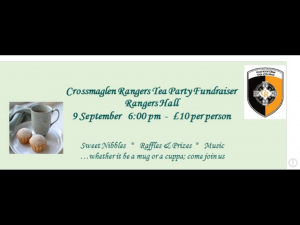 There is still time if you would like to be a host/ hostess or to attend the tea party, PM Cross Rangers or contact Sarah Jane Carville McGrath for more information. 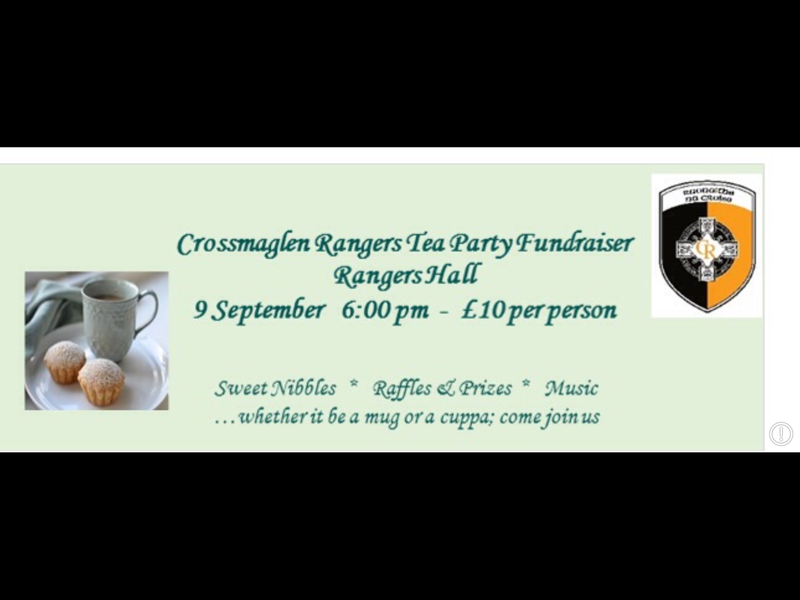 Can all hosts/hostesses please come to a short meeting on Wednesday evening at 7.30pm, back room of the Rangers Hall. Irish dancing begins Monday 3rd September, 4.15-5.15pm. Preparations are in full swing for our night at the races which will take place on on Friday 26th October at Dundalk Stadium. It promises to be a great nights entertainment. All race goers will be in with a chance of winning some super getaway breaks. More information in the coming weeks but be sure to keep the date free. We send our very best wishes to Kathleen Carville who is in hospital in Dublin at this time. Wishing you a speedy recovery Kathleen. Well done to all our members who received exam results this week and good luck as you move on to the next chapter in your life. 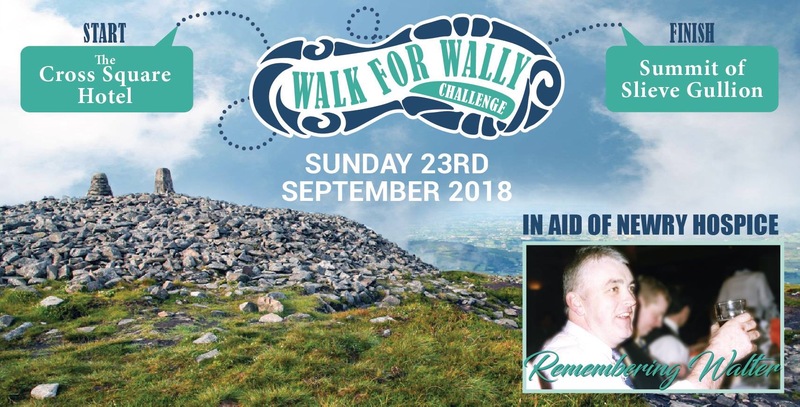 A very important walk will take place on Saturday 23rd September. It will commence at the Cross Square Hotel and conclude at the summit of Slieve Gullion. The walk will be in memory of the late Walter Collins, Carron Rd and all proceeds from the walk will go towards the Southern Area Hospice. The entire Crossmaglen Rangers Club send their deepest condolences to the Brady family on the recent sad passing of Benny, Championship medal winner 1947, lifelong member and supporter. 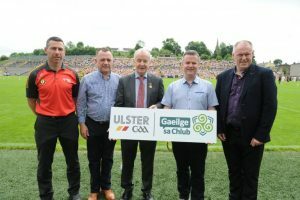 Ar dheis Dé go raibh a anam. Posted: August 26th, 2018 under Club News.